If you look through the forums there is a lot of talk about Python 2.5 or Python 2.6 and suggestions to go back to Python 2.5 – that seems not to be the problem at all because it fails in 2.5 as well with the same error. 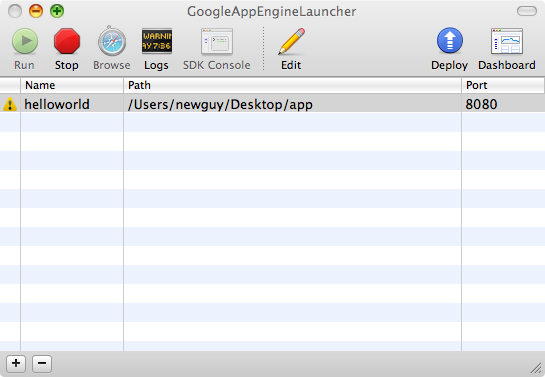 I have carefully reproduced the problem and it is when a non-administrator person tries to run the App Engine Launcher. The fix is to simply make the person an administrative user. And here is the strange thing – once you make the use an “Allow to administer this computer” user and start App Engine once as an the user with admin powers and then log out and take a way admin powers and then log back in – then it works! Crazy. This problem is generally reported on Mac OS 10.6 versions. This entry was posted in Uncategorized on March 12, 2010 by Charles Severance.